François-Paul Journe began drawing new time measuring instruments from a very early age and today his peers throughout the world have recognized his ingenuity and his unique sense of technique and innovation. François-Paul Journe worked on the creation of a new concept of fountain pen without a cap with an entirely new concept. The result is his highly original retractable system, registered with a patent, whereby the extremity of the pen comprises 6 flaps that open and close much like the delicate petals of a flower. This first collection of avant-garde writing instruments, fountain pen and roller, is entirely guilloché by hand in the finest tradition of artisan craftsmanship, and made in platinum PT 950 or 18K gold, the same symbolic precious metals as his exclusive watch creations. 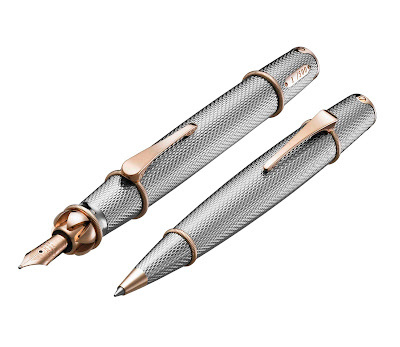 Produced in Limited Edition of 500 each, the set is comprising a fountain pen and roller lacquered to provide a more pleasing sensation while writing. The highly distinctive collection of F.P.Journe of writing instruments in which the art of the jeweler and the goldsmith intertwine is available in the 6 exclusive F.P.Journe Boutiques in Geneva,Paris, New York, Tokyo, Hong Kong, and Beijing, as well as from authorized retailers.